OneJet is a newer scheduled commercial airline service that flies among medium-sized cities offering direct service where there is currently only connections. OneJet utilizes 7-8 seat private jets but flies from commercial terminals and offers time savings for a better flying experience than the big carriers do in first class. I had business in Louisville, Kentucky and was short on time. Living in a city like Pittsburgh, I have to make tough choices when I am short on time. If I travel by air to a non-hub city, I will undoubtedly connect somewhere, have a layover and a second flight to the journey. If I would drive from Pittsburgh to Louisville I could count on seven hours of transit which burns a day to the meeting, the day of the meeting and the day returning. Flying on American Airlines saved little time. Their comparable flight would leave a little earlier, fly me to Charlotte (books in at 1.5 hours) then layover for a couple of hours to line up my next flight and continue to Louisville on another hour flight or so. That’s 4.5-5 hours depending on how my flights go and at least two opportunities for a delay to or issue to slow my progress. I would also book a coach seat and hope to clear my upgrades, though on such short segments I am really just getting the benefit of the wider seat and it’s a gamble. At least if I was driving I would have the ability to control my fate. With OneJet, it’s just a one hour flight gate-to-gate. The seats are wider, the inflight service is roughly the same (they distribute bottles of water and snacks prior to boarding), wifi is free, the flight is direct, it’s around the price for coach – and frankly you feel like a boss. 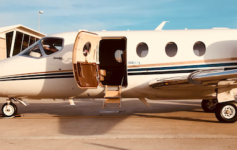 Unlike SurfAir which operates the California and Texas markets on a subscription basis or JetSmarter which is members-only or empty leg flights, OneJet is scheduled service. Their fares are fully searchable on Google.com/flights and other Online Travel Agencies (OTAs). It is my experience that their prices are also precariously close to the lowest cost on the market for a coach experience though that’s not what is really being delivered. Currently, the disparity has expanded and some of the major carriers are closing the gaps. At the time that I booked my flight, it was just $1 more than the option to fly American on a 4.5 hour journey over my 1 hour journey for the direct. On short notice trips, OneJet is within a few dollars of the competition and worth the premium certainly. With a little more time to make plans, the price delta becomes more profound and OneJet loses one edge of its double-edged sword. A direct flight still beats a connection any day, all other elements being equal. Reasonably priced when compared to the big carriers. While guests don’t necessarily need to stop by the counter to retrieve a paper copy of their ticket, I still decided to try it out. With 180 flights/week from Pittsburgh, the carrier averages around 200 available seats per day on flights spread out from morning until night. That means that checkin is fast, friendly and overstaffed. They roll out the blue carpet for their guests and it’s the smallest thing but it did help to make me feel like a rockstar. Beyond the counter where guests can print their own tickets, there was also help from staff who seemed to be very excited to be working at OneJet. Expedited security processing is part of the ticket and guests can show up pretty late in the process if they have TSA Pre-Check. As you might imagine, with just 8 available seats (5 seats occupied) the former American Airlines gate (D88) in Pittsburgh was empty. I have found that while lounges are better, waiting for a nearly empty flight in a disused portion of the airport is almost as enjoyable. Who needs a lounge with free internet and just four other passengers? I was offered a bottle of Evian and a little snack along with a newspaper of my choice and to gate check my roll aboard which would be unavailable in the cabin anyway due to size and space constraints. Our closely held group of five made our way down the jet bridge to a mini staircase and onto the tarmac. One staff member collected my bag and placed it in the hold while another led me onboard. The seat was as good as I have found on any of the domestic carriers in first. The seat was wide, leather and moved around quite liberally if so desired. During one flight I had someone opposite me and during takeoff and landing leg room was a little tight but not the end of the world. Once we were safely in the air, we were able to swivel our chairs out and give ourselves more room. In case you’re wondering, yes there is a bathroom onboard. This is it. From our seats with the cockpit door open, the First Officer came out to give us our briefing. There was a little bit of safety and then some other notes we needed to keep in mind. There was no FA on the flight, there was literally no point both because of the size of the flight and the duration. The pilot also explained that because the pilots would not come into the cabin, that a series of bells would explain when the wifi was coming on and off and how to contact the flight deck in the event of an emergency. The First Officer was polite, to the point, and effective. Ground staff was pleasant at every turn and helpful all along the way. It felt like a special experience for me as a customer and that they genuinely like what they do. If anything, however, they are over-staffed. Another aircraft in PIT awaiting departure. OneJet makes one day trips reasonable and affordable. That gives me up to two days back in a given week for roughly the same price. Not only am I pleased with the direct flight but my employer also appreciates less wasted time in transit and guaranteed wifi during my journey. During the entire process I am only out of communication during takeoff to 10,000 feet and then 10,000 feet down. And it was a lot of fun. The flight felt fast, private (even though I was not alone on the plane), comfortable, and reasonably priced. Not only would I fly OneJet again for business purposes, I am looking to take my family on a trip on the carrier. Two thumbs way up. Have you had a chance to fly on a light jet/private jet whether scheduled, empty leg or full charter? Would you take OneJet if they offered flights from your city? I have co-workers who take this exact flight on a regular basis but had to stop recently due to unreliability. AmEx business travel just stopped supporting this airline because delays are so frequent…I do hope that doesn’t deal a death blow to their operations which I believe are already struggling, however they need to get their operations in order if they want to continue to attract business travelers. That’s a shame to hear. I have an upcoming interview with the CEO where we discussed fleet size. Look for that soon. I loved my one flight from Pittsburgh to Milwaukee. But seemingly everytime I’m at PIT there’s at least one departure or arrival listed as “cancelled”. I agree, though it’s anecdotal for me. Their stats don’t show that but it seems like it happens a fair bit. I hope you can impress upon the CEO we want and need OneJet to succeed in PGH but it won’t happen without a back up aircraft. I’ve flown OneJet to SDF, CVG, RIC & BDL. My experiences getting to my destination on time or at all out of PIT are 50/50. I agree with the positives you mentioned; the gate agents, pilots, cities serviced and pricing. It’s a big hassle getting a text on Sat or Sun that your Monday morning flight is delayed or canceled. That leave me little time to deal with my corporate booking agents online tool and very few options to chose from to get where I need to go. I’ve had to take a departure of 0600 with connections or rearrange my entire week (I fly to 9 states) when OneJet is unreliable. I’ve emailed customer service about these experiences but haven’t gotten a single response from anyone. I hope you can offer them some insights so that they can survive. I have sent your concerns on to the CEO and addressed it in an interview with him as well: http://bit.ly/2heA0DR – I share your desire for them to stick around and agree that equipment consistency is key to that mission. Kyle, I also agree that the OneJet model is dynamic. I would prefer to fly OneJet exclusivley if possible. However, I feel my days as a customer are numbered sadly. I have flown four times. Two of which were canceled and one was delayed. I have two flights prescheduled and only kept them due to the cancellation policy. Do you anticipate improvement anytime soon. Full transpar Cat is appreciated. I’m happy to try again in the future but can’t afford the losses. This has led to m losing airfare costs, business revenue and loss of productivity. At this time I would not recommend OneJet to anyone. I look forward to your feedback. Are you able to carry anything on board, like a laptop. Does not seem like there is any room on board to store anything. I don’t know how I left this out of the review. You essentially gate check everything but take out what you really need. Most flights are just 45-80 minutes so most passengers grabbed their laptops and maybe a book. My flights were short and I had work to do so only having my laptop was fine. I understand you will start service from a Buffalo NY to Albany NY. I fly with my small dog that serves as a comfort animal. I have medical documentation from my doctor. Will I be allowed to travel with my small dog ? If it’s medically permitted I don’t see why not, the service is every bit a regular airline, just with the adjustment of amazing planes. You’ll have your own challenge on a full flight of keeping the dog on your lap but flights are short and assuming the dog is well trained I’m sure it won’t be an issue. There is a seat outside of the cockpit next to the door that, if you can secure it, will be ideal for extra space and to be away from other passengers. The quarters are tight (it’s a 7-seat private jet and they all are) so I think other passengers would be the struggle and not the airline. I’m confident it wouldn’t be a problem. OneJet has a great concept; however, when they cancel a flight at the last minute it leaves a very bad taste in the mouth of the traveler. I bought my son a ticket from Richmond VA to Pittsburgh PA. They canceled at the last minute which made us scrabble to find another flight. Now, instead of an hour flight, it will take my son over 6 hours to get home. Will I ever book with OneJet again? No. It isn’t worth the stress. I can sympathize with that and understand how hard that would be (and disappointing). Cancellations seems to be a concern and I did ask some questions regarding maintenance in my interview with the CEO (http://bit.ly/2heA0DR) but it seems they are coming to the other side of it. I hope they are able to work some of these things out, cancellations and lack of replacement aircraft is the number one reason I refuse to fly Allegiant no matter how cheap their flights may be. When are you starting nonstop from Memphis to Kansas City? I don’t know if OneJet plans to start that service. It makes sense given their route structure, but I couldn’t say. Well I was so close to booking a flight from Pitt to west palm. Usually I fly to fort lauderdale and have to hop on a shuttle to a train. This OneJet flight would have been perfect. After reading the reviews and seeing so many cancellations I don’t think I will. I’m not the best at traveling and wouldn’t have a clue what to do if they called and cancelled. I am sooo disappointed. We had the exact same situation (PIT-FLL) and got a chance to try the new West Palm Beach service on OneJet. We loved it. They have a very interesting configuration (review coming soon) but if they called to cancel, they would replace it with another service. They are a growing airline with a unique product so I give them a few allowances that I wouldn’t extend to a larger carrier in business for 20 years plus. I’d give it a shot, I don’t think you will be disappointed. I’d like to know about the offer to “replace with another service” if cancelled. I received an email today (6/5/18) from OneJet informing me that the round trip flight I booked quite a while ago for 6/22 from PIT to PBI (return 6/22) had been cancelled. The number provided went to a message that disconnected after about 5 cycles. I finally reached a human on my 4th try who told me all they could do is refund the cost of our two fares, and I still have plenty of time to find another flight. Unacceptable. I was given the VM of a supervisor (Audrey) who has not returned my call. Unacceptable. The email stated it was a “computer glitch” on their side. They need to make their mistake right – get us on a comparable flight. What is your understanding of how they handle such situations? Thank you.